Emergency Lighting is a cornerstone of successful fire safety planning and well implemented Emergency Lighting saves lives. But your Emergency Lighting must operate successfully at the all important moment when it is needed most This is where Raydaw Fire Protection can come in and service your Emergency Lighting system to the highest standrds. Raydaw Fire Protection carries out servicing to all types of Emergency Lighting systems across the Northwest. 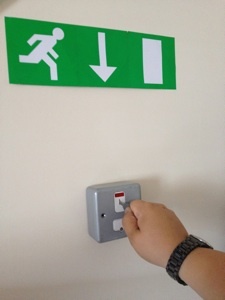 Our engineers are fully qualified Emergency Lighting Technicians; not driven by any commission based incentives. Raydaw Fire Protection have more than 16 years experience servicing emergency lighting within all types of buildings and fire safety environments. You will find our willingness and ability to meet your quality of service and pricing requirements refreshing. Emergency Lighting is a cornerstone of your Fire Safety strategy. We understand that you require high quality Emergency Lighting Servicing at a very competitive price. We offer competitive annual Emergency Lighting Service solutions and callout services to restore your system, diagnose faults and repair fualty emergency lighting units.